heart disease | You Deserve to be Healthy! It has been estimated that most of us consume less than 11 grams of fiber a day. Put that up against the recommended 20-40 grams we need depending on your age and gender. We now eat more low-fiber processed foods than ever before and it is killing us. Fiber is major disease fighter: It clobbers constipation, eases heartburn, protects you from ulcers, halts diarrhea, prevents gallstones, lowers colon cancer risk, calms IBS, lowers high blood pressure, helps fight diabetes, reduces breast and prostate cancer and reduces weight gain. While that list is long it is not by any means the complete list of what fiber can do. There are two types of fiber: soluble and insoluble. Soluble fiber dissolves in water to form a soft, gooey liquid or gel that can be fermented by the bacteria in the gut and absorbed into the body. Insoluble fiber cannot be digested by the body and passes through unchanged. Both types are important to maintain a healthy digestive system. Low intakes of fiber are associated with increased risk of bowel diseases and disorders like constipation. 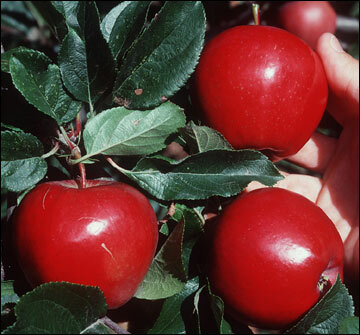 It is also thought to prevent some diseases such as cancer, heart disease and has implications for reducing diabetes. Changing to a high fiber diet is not difficult and should be done gradually as it may upset your digestive system. Drinking water while eating a high fiber diet is very important. Undigested fiber holds fluid in the gut to form soft and bulky stools that move quickly and efficiently along the bowel. If you do not drink enough water but increase your fiber you may become constipated. The old way used to be to add bran to everything you ate. Bran can be a huge irritant and contains phytates, which can interfere with the absorption of essential mineral such as iron, calcium and zinc. It is important to get both types of fiber from natural sources. Not only will you benefit from the fiber but also all other the natural vitamins and minerals. One of the easiest ways is to switch from white bread, white pasta and white rice to the whole wheat alternatives in each of these foods. Be careful if you have a gluten issue! Most foods that are high in fiber also tend to be filling and have a lower calorie count than their more refined alternatives, which makes these foods great choices for weight-loss. Wash fruits and vegetables but do not peel. You may want to go organic for these foods, such as apples, pears, peaches, carrots, and potatoes. When you add vegetables to soups and stews, do so in chunks and if you do puree or blend do not strain the vegetables as you lose a huge amount of fiber this way. Add grated vegetables to casseroles, lasagna, shepherd’s pie and stews. It is amazing what adding high fiber foods to your staples can do. An average portion of fresh tomato soup has 3.09 grams of fiber but add onions and lentils and it jumps to 4.27 grams. Ordinary coleslaw has about 2.92 grams of fiber but add celery, raisins and dried apricots and it rises to 4.25 grams. Adding fiber to your diet is an easy way to combat not only digestive issues but also may other common diseases. It is one of those really important things that I work on with my clients, along with adding more water and exercise to their everyday life. You Deserve to be Healthy So Eat More Fiber! I’ll Take Mine With Honey! Drinking Tea. Just finished listening to an old podcast of The Splendid Table and one of the topics was white tea. Now I’m as much of a tea freak as they come but I had no idea about teas. Seems that all teas come from the same plant: Camelia sinensis? Black, green and white are different because of the way they are processed. Black is the most processed it is rolled, dried and oxidized. That process produces it’s distinctive flavor. Green is next with unoxidized leaves but heated to eliminate the enzyme that causes oxidation. White tea or some call raw tea is dried in the sun for day (the other teas are dried in a few hours) and then heated to reduce moisture further. Originally grown in three small villages in China, white tea has become so popular that it is now grown all over the world. All teas have some health properties such as black is known to reduce heart disease and green, cancer with it’s super anti-oxidant content. All teas help lower blood sugar, kills bacteria in the body, enhance bone density, prevent cavities and boost metabolism that promotes weight-loss. Some other teas we see out there have a basis in these three teas but with additions. Oolong tea is a mix of black and green teas that have been fermented. This tea is known for it’s digestive properties. Earl Grey tea is black tea with bergamot added. Now my favorite category of teas, herbal are not really teas at all. They are dried leaves and flowers and are only considered teas because they are dried and we steep them in hot water, much like real tea. I drink tons of tea and some I do so for more medicinal reasons – immune booster, cold and sore throat fighters, menopause symptom relievers, mental clarity promoters, and calming teas like chamomile. I love that a cup of warm comforting tea can work its magic and taste so good. 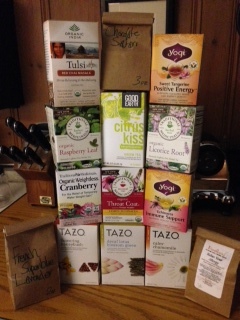 Here are a few of the teas in my closet. I am really excited because I just ordered several blends of herb teas from a supplier in Canada. These blends, help detox the body, purify the blood and provide a restful sleep. I have included a couple of cool websites and well as the website where I ordered my tea, just in case you’d like to check them out. 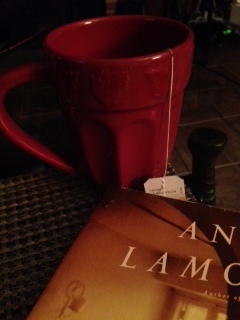 Think I’ll go have a cup of blue lavender tea and read a little Anne Lamott and relax! I’d love to hear about your favorite tea. Leave your comments below! Your Deserve to be Healthy! Eat Your Way To Good Health! The Simple Solution Health Issues! Read a great article tonight in The New York Times Magazine all about kale. Read more…. Yep kale is all the rage, has been for a while now. Most people I know love it but there are a few, very few that do not, and still fewer that have never heard of it. Over the last 4 years I have turned many a client, adult as well as kid, on to kale with my Marinated Kale Salad, Baked Kale Chips and my Kale, Sausage and Quinoa Casserole but here’s the great thing…. 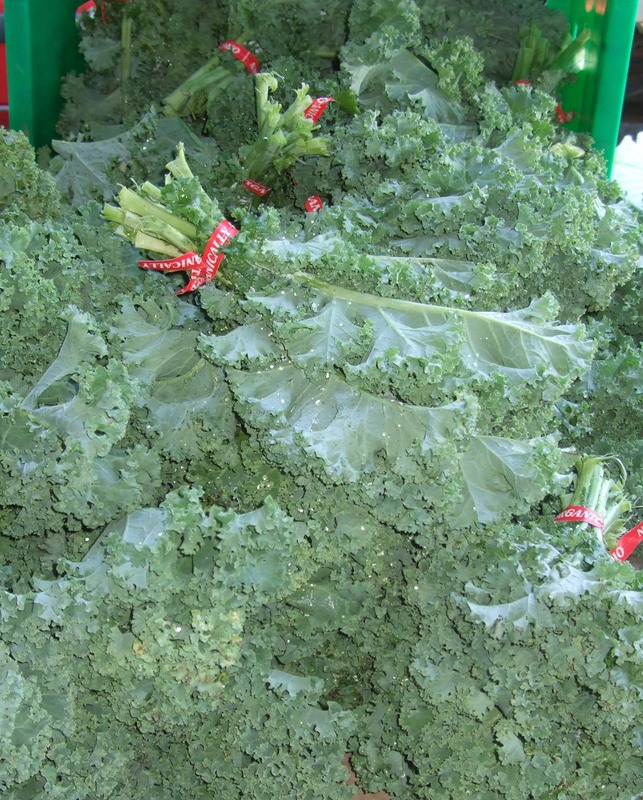 Not only is kale delicious but kale is incredibly good for you. That’s a twofer….. It aids in digestion, boosts your immune systems, it’s high in calcium, vitamin A, C and K, high in antioxidants and is a super detox food. Wow so let me get this straight…you can eat something you love and…and…it makes you healthier? No sacrificing taste to eat healthy? No way right? I have made it the mission of my business to create, share and promote healthy delicious food as a way by which to help my clients improve and maintain good health for the rest of their lives. Finding out the correct food for your health issue and eating that food can, reduce your risk for heart disease (and we no longer mean a low fat diet), reverse diabetes, lessen symptoms of menopause, slow down and even reverse signs of aging, reduce symptoms of arthritis, improve symptoms of auto immune diseases, reduce or eliminate digestive issues like IBS, colitis, diverticulitis, gas and bloating, boost your immune system, fight cancer – do I need to go on here? Many of my readers and all of my clients know the power food has to improve and even eliminate their health issues. All this with no side affects and no big price tag. But what is good health if you have to eat crappy tasting food that you hate…I’d call that torture! I will be making available special editions of The Simple Solution dedicated to health issues that are common in middle-aged women (and probably a lot of men too). We will have editions dedicated to diabetes, a nationwide epidemic that has a strong food base, arthritis, heart disease, cancer, aging, menopause, boosting your immune system, sleep issues, memory and depression. Each low-cost mini-cookbook issue will address a specific health problem and give you lifestyle change suggestions and easy recipes that will have you loving the food you need to eat get improve or even eliminate the health issue you are experiencing. If this type of information interests you, please go one over to my website and sign-up for my newsletter. Sent bi-weekly my newsletter will provide details as to The Simple Solution Issues available as well as program offerings and private health coaching information. If you are looking for additional resources or assistance with a health issue that has you concerned please contact me at MindyKannon@yahoo.com. And always remember You Deserve to be Healthy! Shouldn’t you be eating some kale! 1 carrot, peeled and sliced into half moons. Place the kale in a large bowl with the avocado. Gently massage avocado and kale together for about 3 minutes. The kale will shrink and become darker and more pliable. Pour on apple cider vinegar and let sit for 15 minutes. 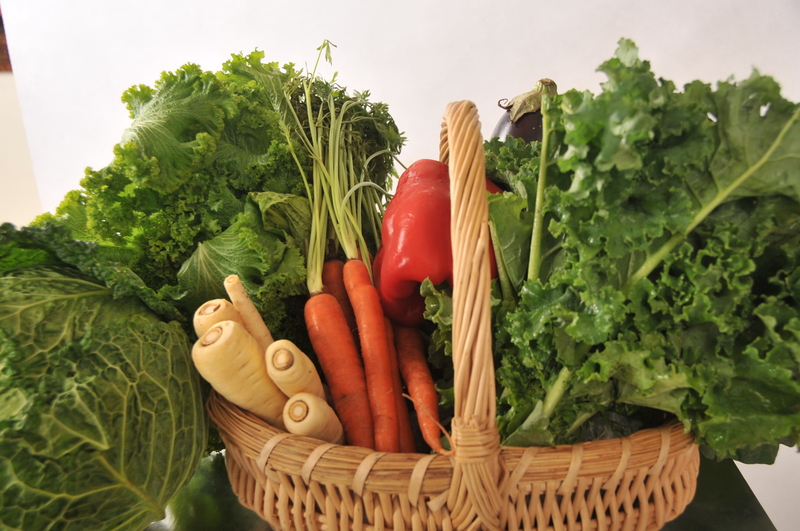 Reserve a small handful of carrots and apple slices for garnish and then gently fold into the kale mixture. Divide the salad among four plates. Top each plate with the sliced carrots, apples, raisins and scallions. Scatter the almonds on top. Salad can keep for a few days in the refrigerator.